1- group_id ===> Can I change my group ID to another group ID and add my units to it !! 2- Unit_ids ===> Can I change My Unit_ids with other groups unit ID’s and add them into my test group !! I knew that facebook was only checking on group_id not unit_id that’s why I was able to add any unit to my group cause the server don’t check whether this unit is belong to the same group id or not. 1- When I add other Units to my group I can see it from the Group Insights option, which means I can download it too. 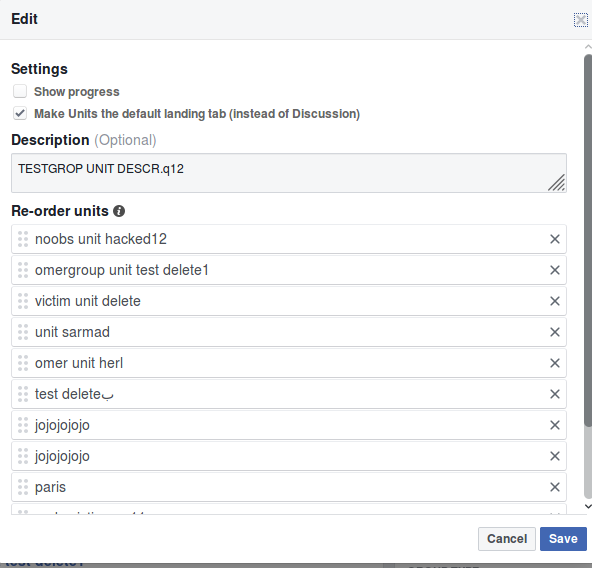 2- I can make those units from other group Undeletable once I added to my group and also I should invite the admin of other group into my test group. Inviting the admin of other group was the trick to make their units undeletable. When I saw this part from their reply “in your report. In our test when the attacker adjusts the id’s of the unit, the victims unit shows on the attacker’s page, however, the victim is still able to delete that unit”. he make feels like seeing Units (other group units that added to my test group) in My Unit tab is a normal issue and I thought they will know it can be downloaded through Group Insights , that’s why I only focused on Undeletable Unit part. 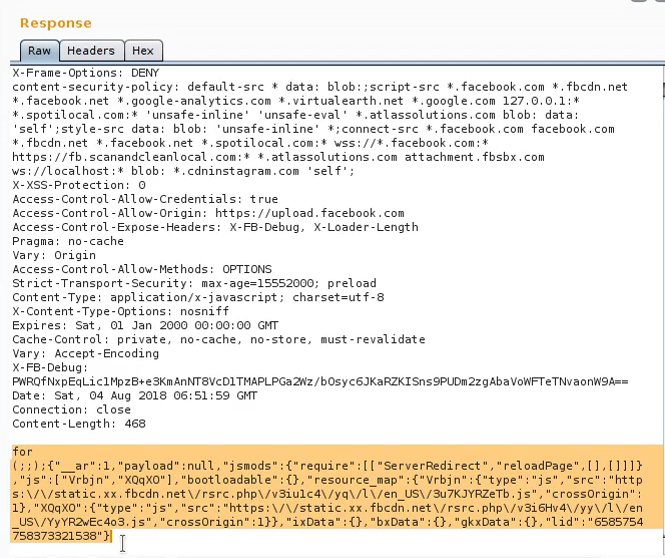 In 1-September-2018 I saw my fellow Richard Telleng posted bug in Facebook Bug Bounty Community group, when I saw his PoC video, it was the same bug that I submitted the same root, he submitted his bug in 18-August, while my bug was Triaged in 17-August, and he got bounty for it in 1- September, he only show how to download units from other groups using the Group Insights option, he didn’t know about the other impact (Undeletable unit). 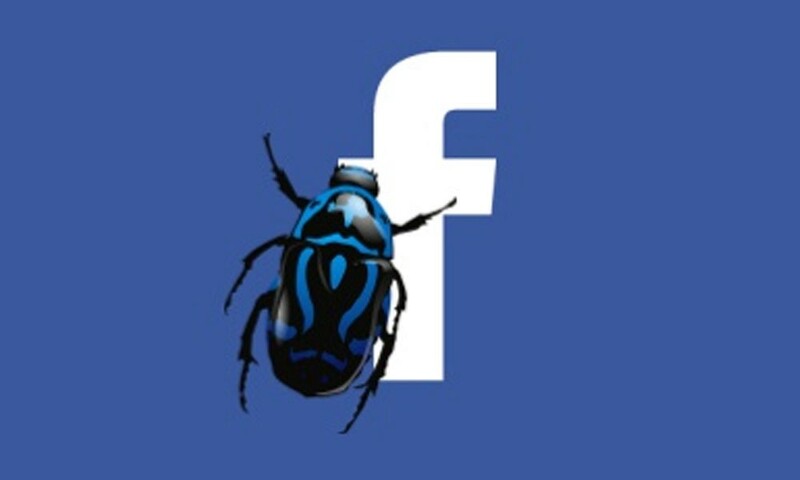 I informed Facebook Security Team about this and told them that it was my bug and I am the first one who reported to you, they told me that I didn’t mention downloading other group units from Group Insights. so they only rewarded me the first impact which is (undeletable unit). Some people are connected to each other with a lot of things like thoughts, sharing ideas ..etc, It’s looks like Me and my fellow Richard Telleng are connected to each other with bugs :) see why. Maybe some of you will say this is a silly bug, why Facebook pay for this, well, I think if someone can control your unit it’s not your unit anymore :). Finally fixing this kind of bugs is always the right thing to do. 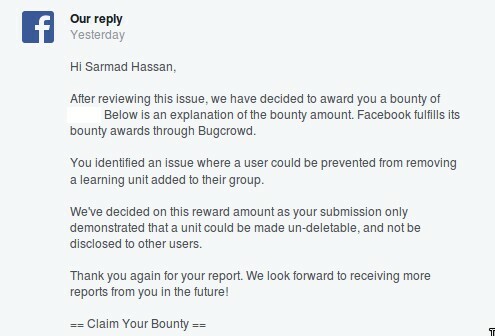 I would like to thanks Facebook Security Team for the Bounty. Also I would like congratulate my fellow Richard Telleng for getting reward for the same bug. Don’t make the same mistake that I did, make sure you explain everything to the Security Team.